PASSAGE 1 - Refer to this passage to answer questions 1 - 13. Horseshoe pitching has existed as a sport for over a thousand years. The origins of this sport are most likely based in athletic competitions that involved throwing a heavy discus (imagine a stone Frisbee®). It is believed that fans of the Greek discus competitions created their own game by using discarded horseshoes and throwing them towards a stake in the ground. In 1869, the British devised the first actual rules for the game of “horse-hardware” pitching. There were limitations to the size of the horseshoes and the distance between the stakes at either end of the court. Today the membership of the National Horseshoe Pitchers Association of America totals over 15,000, with over 6,000 members active in league-sanctioned tournament play. If you want to enjoy the game of horseshoes with your own family and friends, it’s easy enough to get started. Select your court area: Find a rectangular surface of lawn or dirt that is flat and level and measures at least six feet wide and 46 feet in length. For safety, locate your court away from houses, decks, and other buildings, as well as far from any streets or walkways. Mark your stake spots: Mark two points 40 feet apart and centered within the six foot-width of the court. This is where you’ll drive the stakes. Dig out the stake pits: You’re going to dig neat rectangular areas at either end of the court. The stake pits should be anywhere from four to eight inches deep, with the stake spot in the center of the rectangle. Load the pits with your “filler”: Loose dirt or even sawdust will do. You will have a much better court on which to excel at the game by using sand or clay. Use enough filler to bring the stake pit up to or just slightly below ground level. Drive the stakes: Ideally you’re using metal rods that have smooth sides and are one inch in diameter and about 36 inches in length. You can buy these at a scrap metal yard or any good home improvement store. Drive the stakes into the centers of their respective pits until they extend 14–15 inches above the pit surface. Mark off your foul lines: Foul lines are marked off approximately five feet in front of the stakes at either end of the court. You can anchor the stakes in a five-gallon plastic bucket filled with quick-dry concrete and then bury the bucket. You can drill a hole through a small log, pound the stake into it, and bury the log, rotating it so the stake is at the right height and angle. Each player pitches two consecutive shoes at the same stake and then walks to the stake, totals the points, and pitches back to the other stake. Full pitching to both stakes is called an inning. Players must pitch from behind the foul line. Experts recommend concentrating on the spot where you want the horseshoe to fall while lofting the horseshoe with an easy underhand motion. * You can rotate pitching order or allow the highest scorer from the previous round to throw second. Games are usually played to 40 points and extra innings are played to break ties. PASSAGE 2 - Refer to this passage to answer questions 14 -24. The following excerpt from a novel describes the experiences of a young girl growing up in South Boston, Massachusetts (also known as Southie), during the early 1900s. 1 On D Street there was no need for alarm clocks: the drays,1 ever punctual, were an army storming the gates of sleep. The wooden wagons were heavy and low-riding with loud rattling wheels, their broad planks too battered and begrimed to recall distant origins as trees. 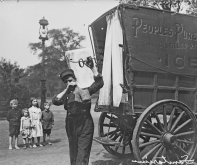 Each dray was pulled by horses—two, four, or sometimes six per wagon— pounding down nearby Third Street. Windows rattled and floors shook; the sound was a giant hand shaking Lydia Kilkenny’s sleeping shoulders. Each morning she did not awaken to the sound, but inside it. In winter the drays came when the sky was still dark, their pounding hooves sharp reports against the frozen cobblestones. In summer, perhaps because the sky was already pale with light, the sound of the horses seemed kinder. 2 She knew the clattering wagons were bound for Boston proper, but the vague tangle of streets across the Broadway bridge surfaced in her mind with the sound of the horses and resubmerged with its diminishment. As the flow of drays subsided—the wagons no longer traveling two by two but single file—pounding hooves gave way to the creak of floorboards and the muffled voices of neighbors. Factory whistles blew. Church bells rang. The vegetable man made his way down D Street shouting, “Fresh tomatoes,” even if there were no tomatoes, because those words distinguished him from the other vegetable men who plied their carts through Southie. 3 South Boston belonged to Lydia as profoundly and wordlessly as her thimble finger. Her knowledge of its streets was more complete than any atlas, her mental maps reflecting changes that occurred from season to season, day to day, and hour to hour. Each time she left 28 D Street—one among a row of identical triple-decker tenements lining the street like so many stained teeth—her route reflected this internal almanac. If on a Tuesday afternoon her mother wanted flour and jam from Hennessy’s, Lydia would avoid the more direct route along Fifth Street due to her dislike of the soap grease man and his fleshy block of laundry soap. No matter what the errand, Third Street was best avoided in early evening when the flood tide of drays returning to their stables posed a threat to both body and nose. 4 In deep winter, when ice and hard-packed snow made walking treacherous, West Broadway was the place to catch a ride on the tailboard of a snow dray delivering milk [or] groceries, . . . but sledding was best saved for Dorchester Heights. If a good enough sled could be found, and if the streets were not too crowded, it was possible to start at G Street and traverse almost a quarter of the alphabet—all the way to L Street. Whether because he was luckier or a year older, Michael was the superior sledder; at her best Lydia could only make J Street before her sled or her resolve gave out. 5 Because Dan Kilkenny was an iceman, the whole D Street gang was in thrall to Lydia and Michael in summer. In the thick of that season there were few things more magical than ice—the blocks that emerged, impossibly, from the back of the wagon, steaming not with heat but with cold, the unmistakable stomp of the iceman conquering the stairwell, gleaming blocks of ice piled on his broad back like enormous melting diamonds. . . . Lydia was certain Heaven resembled the interior of her father’s ice wagon: a dark place, cool and quiet. There the salt hay, sawdust, and straw effaced the airborne tang of leather and glue from the nearby shoe factory and muted the call of the ragman. 6 On very hot days there was no need to confer in advance. The lot of them would be playing ball in Commonwealth Park, or ambling toward the beach at City Point, or playing marbles or Kick the Wicket on the street. Without a word Michael would turn to Lydia, or she toward him, and with a whoop they would preempt the day’s pursuit and set out for ice. At the sight of Dan Kilkenny’s brood, the iceman would toss out an extra block, the surplus ice arcing toward the street in a dream of captured light before exploding into frozen bliss on the cobbles. Decorum was traded for the fleeting comfort of ice pressed into the perfect place. Frozen shatterings found their way into mouths, inside shirts and dresses, under chins, and atop closed eyes. Ice was nestled into the hollows of throats and hammocked by the webbing between fingers and toes. Ice bent the iron rule of summer for a few precious moments before the heat clamped down again. 7 For ten years, this was enough. Then in fifth grade, Lydia saw a city map and realized her entire world was the smallest finger of Boston’s broad hand. The hazy destination of the morning drays acquired focus. Across the bridge lay Boston Common and the swan boats of the Public Garden. Across the bridge lay Washington Street—the longest street in all New England—which began like any other but then continued south, a single, determined thread of cobblestone that wove itself through every town from Boston to Providence. Once Lydia saw Washington Street she knew she could not allow it to exist without her. “On D Street” from Wickett’s Remedy by Myla Goldberg, copyright© 2005 by Myla Goldberg. Used by permission of Random House. The following is a draft of a report written by a tenth-grade student for her biology class. Male and Female Brains: Are They Different? 1 Boys are better at math and science; girls are better at language. Men are more competitive; women are more nurturing. Are these assertions accurate, or are they aimed at stereotyping genders and limiting a person’s true potential? Scientists have considered these questions for generations, but not until recently have they been able to reach some dramatic conclusions regarding the differences between human males and females. Because of new brain-imaging technology, scientists are now able to concentrate their studies on specific areas of the brain. Within the past decade, scientific research has noted differences between male and female brains that are more dramatic than previously imagined (Ripley 52). 2 To begin with, the male brain is approximately ten percent larger than the female brain (SFN par. 6). Even when the comparison is adjusted for body weight, male brains are proportionately larger. This might lead one to the assumption that males are more intelligent. However, IQ tests show, for the most part, that men and women perform equally in all fields. 3 Conversely, female brains have a larger surface area of the corpus callosum. This network of nerves is responsible for connecting the two sides of the brain. This allows the more emotional right side to “talk” to the more analytical left side of the brain. One might wonder, then, if women are more intelligent, but this is not the case. MRI technology has shown that the male brain is more specialized and uses specific parts to perform tasks. By doing this, male brains have a greater capacity to organize certain information and, at the same time, filter out distracting information that is not relevant to the task they are performing (Kastleman par. 5). 4 There is also the question of gray and white matter. According to a study conducted by the University of California-Irvine, female brains have nearly 10 times the amount of white matter than male brains, and the male brain contains more gray matter. The gray matter represents information processing centers in the brain, while white matter represents the connections between those processing centers (University of California, Irvine, par. 4). Again, neither finding suggests that one brain is superior; rather, it merely shows how the two brains function in different ways. 5 Specific, highly developed areas of the brain in both males and females are also responsible for fine-tuning the five senses. According to physician and psychologist Leonard Sax, women have a more highly developed sense of smell and their hearing is also superior. However, he maintains that males and females use their senses for different purposes. For example, the two genders would most likely view a landscape differently. A woman will “remember the color and texture of a particular plant and be able to warn people if it’s poisonous,” he says. “A man looking at the same thing will be more alert to what is moving in the periphery. Which is better?” he asks. “You need both” (as quoted in Ripley 56). 6 The rate at which the brain matures also plays a role in the brain’s development. The size of the female brain peaks at around eleven-and-a-half years old; the size of the male brain usually peaks three years later. Consequently, girls are better able to communicate verbally, demonstrate proficiency in handwriting, and recognize familiar faces at an earlier age than boys. However, specific areas in the brain concerned with mechanical and spatial reasoning mature more quickly in boys. This makes them more adept at rotating a 3-D object in their minds (55). 7 With these findings, it would only be natural to conclude that men should pursue careers in the fields of mathematics and science, and women should enter occupations where their social and language skills can best be used. But this conclusion would be erroneous. Throughout this study, scientists have found that the human brain is versatile. It responds favorably to encouragement and high expectations. In the 1800s the fields of physics, astronomy, chemistry, and botany were considered subjects for girls, and they outperformed boys in these subjects. Boys, at that time, were studying foreign languages such as Latin and Greek—subjects now considered a woman’s strong point. And today in Iceland and Sweden, girls outperform boys in math and physics. In the United States, at least fifty percent of those receiving a bachelor’s degree in chemistry or biology are women (60). 8 The debate continues, and questions remain: Is it biological nature that causes people to behave in a certain way, or do humans behave as a result of the type of nurturing they received? Which of the two sexes is the most intelligent? In spite of all the new findings in brain research, these questions will undoubtedly remain unanswered for quite some time. Ariniello, Leah. “Gender and the Brain.” SFN.org 8 March 2005. 10 February 2010 . Kastleman, Mark. “The Difference Between the Male and Female Brain.” Contentwatch. 8 March 2005. 2 February 2010 . Ripley, Amanda. “Who Says a Woman Can’t be Einstein?” Time 7 March 2005: 51+. Because of testing constraints, some of the specifications of the style manual used (such as double-spacing and a separate page for citing works) have not been followed in this paper. PASSAGE 4 - Refer to this letter to answer questions 36 -46. 1 I am afraid that the return address on this letter will set your frail maternal heart a-tremble. I suffered two injuries at the confrontation called Bull Run and am lying in a hospital, recuperating from the effects of surgery. Never fear. I shall heal and no doubt return to the battlefield eventually. You will observe that the penmanship and the signature in this letter are unfamiliar; a young lady, a volunteer giving aid to the Union wounded, has kindly offered to write it for me. 2 Your advice discouraging my enlistment was, in hindsight, well conceived. I must admit that I find I am much better suited to my former life as a professor than to enduring the strains of military life. Luckily, two farm lads, Caleb George and Woodrow Hinnant, from near Hartsville, took me under their wing. Though neither of them has had much formal education, I have found that they are a wealth of useful information. With their able assistance, I have learned how to recognize poison ivy and how to clean my eating utensils with sand in a stream. 3 Our regiment joined the third brigade under General William T. Sherman, a West Point officer considered among the best in the Union Army. He has a receding hairline, a scruffy beard, and a scowl like a chill wind that sends shivers down the spines of humble privates such as myself. 4 You have probably read an account or two of our humiliating defeat. If not, I recommend the article by Horace Greeley of the New York Tribune, as it provides an accurate description of the whole disgraceful episode, including troop movements, skirmishes, and even shameful desertions. It would be a betrayal to voice my opinion on the imprudent tactics and dimwitted strategies employed at Bull Run. The 13th Infantry spread out north of the Warrenton Turnpike, following orders to allow artillery units to handle the combat. These orders, I assure you, I gratefully followed. Caleb, Woodrow, and I sheltered behind a scraggly hedge that provided meager protection from the sweltering Virginia sun. 5 Few preparations had been made for water, food, shelter, or medical aid at Bull Run. The Virginia sun caused as much damage as anything. Dressed as we were in our woolen blues, it was not surprising that countless soldiers fainted from excessive heat or dehydration. My own injuries came early in the afternoon when, motivated by thirst, I crawled to the Bull Run stream to fill my canteen. A bullet pierced my leg and another struck my collarbone. For six hours, I lay helpless on Virginia’s red clay soil. If there were ambulances to evacuate the wounded, I saw none. Well past sundown, a couple driving a mule team came past. They loaded me on their cart with little concern for my wounds. The driver managed to strike every rut, rock, and obstacle the road offered; the pain was excruciating. 6 It was at the Fairfax railway station that my salvation came in the form of a ministering angel. A short, plain-faced woman walked by, dipping water for the thirsty, feeding the hungry, and tending to the soldiers’ wounds. She came to my side, and I was impressed by her competence and compassion. She opened my collar and pressed a cool, wet cloth to my shoulder. 7 “Where are you from, soldier?” she asked as she held a dipper of fresh, cold water to my lips. I responded that I was a university professor from Rochester, New York. Imagine my surprise when she said that she, too, had been an educator—a refined, sophisticated woman kneeling in the dirt to help a humble soldier. Her name is Miss Clara Barton, and she is from Massachusetts. I shall not soon forget her kindness, nor her tireless dedication to alleviating the suffering of others. When Miss Barton was not comforting the wounded, she was assisting the surgeons or preparing food for everyone in a nearby farmhouse. At night, she held lanterns so that the surgeons could continue to work. I never saw her take even a moment of rest. I traveled on the last train carrying wounded to Armory Hospital. Miss Barton stayed with me and the others waiting to be taken to makeshift hospitals around Washington. 8 Miss Barton’s sacrifices are all the more extraordinary given the context in which they are offered. A lowly soldier must endure difficult circumstances in these makeshift tenthospitals, to say the least. Simply to witness someone so focused and determined to help those who are suffering brings a measure of hope to a place otherwise marked by despair. 9 Mother, I must prevail upon your goodness and ask you to undertake a most unpleasant task. Caleb George, the friend of whom I spoke, was injured in battle. Please, Mother, let his mother in Hartsville know that he will write as soon as he’s able. I would hope that some comrade would do the same for me. 10 Now, I have abused this gentle lady long enough. Her hand cramps from holding the pen and trying to keep pace with my ramblings. I bid you farewell. Refer to PASSAGE 1 to answer questions 1 - 13. Which of these is necessary to construct a horseshoe court? Which sentence should be included in a presentation about the proper way to pitch horseshoes? The stake pits should be anywhere from four to eight inches deep, with the stake spot in the center of the rectangle. Drive the stakes into the centers of their respective pits until they extend 14-15 inches above the pit surface. Each player pitches two consecutive shoes at the same stake and then walks to the stake, totals the points, and pitches back to the other stake. What section of the document explains how to use loose dirt or sawdust as filler for your stake pits? Which statement best expresses the main idea of this document? The game of horseshoes was created many years ago and is still played today. Points are scored in horseshoes by trying to pitch a horseshoe toward a stake. Pitching horseshoes is an ancient sport and an easy game to set up and play. Driving the stakes is the most difficult part of setting up a horseshoe court. Which sentence supports the idea that there are variations to the rules of amateur horseshoe pitching? If you want to enjoy the game of horseshoes with your own family and friends, it’s easy enough to get started. For safety, locate your court away from houses, decks, and other buildings, as well as far from any streets or walkways. You’re going to dig neat rectangular areas at either end of the court. You can rotate pitching order or allow the highest scorer from the previous round to throw second. Which question is answered in this document? Who is considered the game’s greatest player? What is the best strategy if an opponent throws a leaner? How long does a game of horseshoes typically last? Where can proper stakes for a horseshoe court be found? Which additional visual information would be most helpful to the reader? Which information would be best to include in a presentation about the National Horseshoe Pitchers Association of America? Games are usually played until one player scores 40 points. Sand is superior to dirt or sawdust as filler for stake pits. The origins of the sport are likely based on discus competitions. There are 6,000 members in league-sanctioned tournament play. Which source would best help a reader evaluate the accuracy of the information in the document? Refer to PASSAGE 2 to answer questions 14 -24. As it is used in paragraph 1, what does the term sharp reports mean? How far was Lydia able to sled? How much older was Michael than Lydia? What neighborhood offered the best sledding? What time of day were the streets most crowded? Which sentence best expresses the main idea of paragraphs 5 and 6? Lydia was certain Heaven resembled the interior of her father’s ice wagon: a dark place, cool and quiet. The lot of them would be playing ball in Commonwealth Park, or ambling toward the beach at City Point, or playing marbles or Kick the Wicket on the street. Frozen shatterings found their way into mouths, inside shirts and dresses, under chins, and atop closed eyes. Ice bent the iron rule of summer for a few precious moments before the heat clamped down again. Which sentence contains an example of alliteration? The wooden wagons were heavy and low-riding with loud rattling wheels, their broad planks too battered and begrimed to recall distant origins as trees. Each dray was pulled by horses—two, four, or sometimes six per wagon—pounding down nearby Third Street. Because Dan Kilkenny was an iceman, the whole D Street gang was in thrall to Lydia and Michael in summer. The hazy destination of the morning drays acquired focus. Which statement best describes the theme suggested in this selection? People do not value what they have until it is gone. Part of growing up involves expanding your perspective. It is important to stay true to your feelings no matter what happens. Choices made during childhood determine the types of adults we become. Refer to PASSAGE 3 to answer questions 25 -35. Which word means the same as assertions in paragraph 1? Which best summarizes paragraph 2? IQ tests are an effective measure in determining the intelligence of both males and females. Although there is a link between body weight and brain size, males are not more intelligent than females. Although there is a difference in brain size between males and females, they seem to be equally intelligent. Males tend to score about the same as females on tests. Read the sentence from paragraph 3. In paragraph 5, why does the author present the findings of Dr. Leonard Sax? Which word means the same as proficiency in paragraph 6? Why does the author compare historical and modern attitudes toward men and women in paragraph 7? Which best expresses the main idea of paragraph 7? Scientists have found that brain types are determined at birth. Expectations can influence performances of males and females. Perspectives on women’s language abilities have changed. Abilities of males and females have reversed in the last 100 years. Which characteristic most clearly identifies this passage as a report? It has a central theme. It is based on factual information. If a student researches the difference in employment status between men and women, which website would be the best source of information? Refer to PASSAGE 4 to answer questions 36 -46. What is the purpose of the simile in this description? In paragraph 4, the words “humiliating,” “disgraceful,” and “shameful” evoke what tone? Which question is not answered in paragraph 5? Why were soldiers passing out? Why did Henry crawl to the stream? What kind of clothing was Henry wearing? Where was the couple in the mule cart going? Which sentence contains an example of figurative language? You have probably read an account or two of our humiliating defeat. It was at the Fairfax railway station that my salvation came in the form of a ministering angel. Miss Barton’s sacrifices are all the more extraordinary given the context in which they are offered. Which image best illustrates a main focus of this selection? Which sentence most clearly illustrates the time period of this selection? Your advice discouraging my enlistment was, in hindsight, well conceived. She opened my collar and pressed a cool, wet cloth to my shoulder. I responded that I was a university professor from Rochester, New York. At night, she held lanterns so that the surgeons could continue to work. Which situation could best be described as ironic? Though they met in a tent-hospital, Henry and Clara Barton were both educators before the war. Though Caleb George and Woodrow Hinnant were from the same town, only one of them was injured in the war. Though Henry was a professor before the war, two uneducated youths taught him how to survive the experience. Though he is unable to write to his mother, Henry has dictated his letter to a volunteer nurse. Which sentence best reflects Henry’s overall attitude about serving in the war? I suffered two injuries at the confrontation called Bull Run and am lying in a hospital, recuperating from the effects of surgery. I must admit that I find I am much better suited to my former life as a professor than to enduring the strains of military life. Dressed as we were in our woolen blues, it was not surprising that countless soldiers fainted from excessive heat or dehydration. They loaded me on their cart with little concern for my wounds. Which sentence contains an example of an allusion? Brian defended his latest film and lashed out at his critics like a wounded tiger. Sheila tapped her pencil nervously on the desk while waiting for the phone to ring. Utterly exhausted, he went to bed and slept like Rip Van Winkle. At the top of Mt. Helios, the locomotive sighed with relief, exhaling steam. Which keywords could best be used to find information about applying to colleges? Which Internet source would be best for finding information about the life of Jack London? 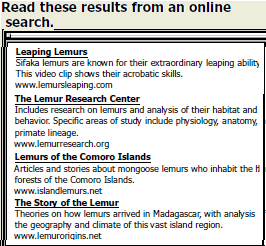 Which website would be best for finding reliable information on the different varieties of lemurs?